This year’s biggest surprise at the Supreme Court: Elena Kagan’s prose. On the current Court, Antonin Scalia has long been regarded as the most dazzling writer. His opinions are a pleasure to read, because they often include sentences like the following: “Like some ghoul in a late night horror movie that repeatedly sits up in its grave and shuffles abroad, after being repeatedly killed and buried, Lemon stalks our Establishment Clause jurisprudence once again, frightening the little children and school attorneys of Center Moriches Union Free School District.” But, after only a year on the bench, Scalia’s newest colleague, Elena Kagan, is already giving him a run for his money. ONE OF THE MOST surprising developments of the last term was Kagan’s emergence as an eloquent voice—surprising because it often takes new justices a few terms to hit their rhetorical stride. Samuel Alito is now one of the most analytically self-confident of the conservative justices, but one of his first dissenting opinions, on the military tribunals created by the Bush administration, was dry and legalistic. 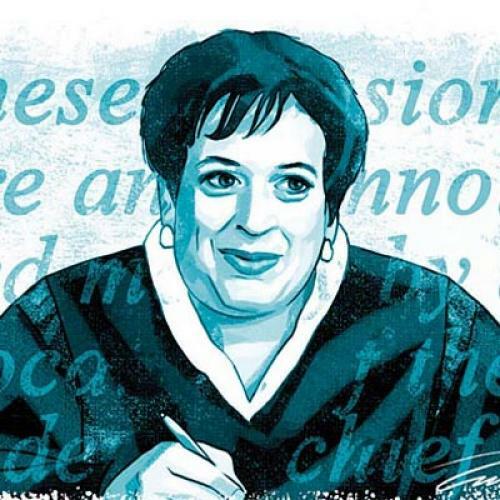 Sonia Sotomayor, who has been on the court for two terms, has not yet developed a distinctive style; instead, her opinions read much like those she wrote as an appellate judge, focusing on factual details and parsing precedents. The Court’s best writers tend to do their most striking work in dissent, unconstrained by the need to pacify their colleagues. (Holmes, Brandeis, and Scalia have all been called “The Great Dissenter.”) So it has been with Kagan. In her first year on the Court, she wrote three dissents, two of which combine Scalia’s gift for the sharp aphorism with John Roberts’s powers of analytical dissection. But she also has something more: an ability to puncture her colleagues’ bloodless abstractions and tendentious arguments, and to explain the constitutional stakes in plain language that all citizens can understand. Kagan’s best dissent came down on the last day of the term, in Arizona Free Enterprise Club v. Bennett. Arizona political action committees had challenged the state’s public campaign financing law. Under this scheme, Arizona gave publicly funded candidates an initial subsidy—about $20,000 in state House races—followed by an additional dollar of matching funds for every dollar that their privately funded opponents spent in excess of the lump sum. Writing for the five conservatives, Roberts struck down this system: Because it was intended to “level the playing field,” he argued, it was a violation of the First Amendment. “Laws like Arizona’s matching funds provision that inhibit robust and wide-open political debate without sufficient justification cannot stand,” he concluded. Kagan, writing for the four liberal justices, challenges Roberts in her first sentence. “Imagine two States, each plagued by a corrupt political system,” her opinion begins. Each of these states seeks to avoid the “cancerous effect of this corruption.” In her hypothetical, voters in the first state adopt the campaign finance restrictions the Supreme Court has approved—such as disclosure requirements and lump-sum public subsidies. But this doesn’t work, because the subsidies aren’t large enough to allow publicly funded candidates to run competitive races. Then Kagan asks us to imagine a second state that adopts a matching-fund system like the one used by Arizona. This state encourages candidates to participate, broadens public debate, and ends corruption. “Except in a world gone topsy-turvy, additional campaign speech and electoral competition is not a First Amendment injury,” she declares. Like good journalism, the best dissents are often colloquial, as if the writer were telling a story about the case to friends over dinner. This was the secret of Holmes’s greatest dissents, which have a breezy disdain for legalisms and technical citations. Kagan is similarly informal—her dissents often read like a really good New York Times op-ed. She likes colorful metaphors—she calls the Arizona program a “Goldilocks solution,” because it provides a “just right” sum to help a candidate compete against others backed by big private donations. Kagan also connects to the reader by taking us into her confidence. “Pretend you are financing your campaign through private donations. Would you prefer that your opponent receive a guaranteed, upfront payment of $150,000, or that he receive only $50,000, with the possibility—a possibility that you mostly get to control—of collecting another $100,000 somewhere down the road?” she asks. “Me too.” The “me too” is an inspired touch—a little badda-bing that has the effect of making the majority look arrogant and out of touch. Kagan’s real strength, however, is her ability to brush away the legalistic smokescreens of justices on the opposing side. Roberts’s majority opinion is based on the premise that the Arizona law restricts speech. “There is just one problem,” she notes wryly. “Arizona’s matching funds provision does not restrict, but instead subsidizes, speech.” She also calls the majority opinion a clear departure from precedent: “In case after case, year upon year,” she writes, the Court has struck down restrictions on speech while upholding subsidies of speech. Finally, she points out that the petitioners in the case, who included candidates for state offices, actually had access to the state subsidies. “They are making a novel argument: that Arizona violated their First Amendment rights by disbursing funds to other speakers even though they could have received (but chose to spurn) the same financial assistance,” she declares. “Some people might call that chutzpah.” This wasn’t the first time the word “chutzpah” had appeared in a Supreme Court opinion: Scalia previously used it in a 1998 case affirming the denial of a National Endowment for the Arts grant to the performance artist Karen Finley. But it was surely the most satisfying. KAGAN’S OTHER significant dissent, Arizona Christian School Tuition Organization v. Winn, was nearly as good. In that case, Arizona taxpayers challenged a state law that gives tuition tax credits to organizations that then spend the money on scholarships for students attending religious and secular private schools. The petitioners argued that this resulted in public money being used for religious education and was thus illegal under the First Amendment. Again, the conservative justices prevailed, holding that the taxpayers had no legal standing to sue, in a 5-4 opinion written by Justice Kennedy. Imagine that the Federal Government decides it should pay hundreds of billions of dollars to insolvent banks in the midst of a financial crisis. Suppose, too, that many millions of taxpayers oppose this bailout on the ground (whether right or wrong is immaterial) that it uses their hard-earned money to reward irresponsible business behavior. In the face of this hostility, some Members of Congress make the following proposal: Rather than give the money to banks via appropriations, the Government will allow banks to subtract the exact same amount from the tax bill they would otherwise have to pay to the U.S. Treasury. Would this proposal calm the furor? Or would most taxpayers respond by saying that a subsidy is a subsidy (or a bailout is a bailout), whether accomplished by the one means or by the other? Surely the latter; indeed, we would think the less of our countrymen if they failed to see through this cynical proposal. Of course, Kagan can’t achieve greatness merely by tossing off pithy one-liners. She also needs to provide a positive vision of values in which she believes. Brandeis’s dissents were great not only because of the arguments they attacked, but because of the principles they championed: the curse of bigness, in corporations and in government; the value of the states as “laboratories of democracy”; and the importance of translating constitutional values like privacy and free speech in light of new technologies. It’s still too early to tell what Kagan is most passionate about—aside from a devotion to government neutrality. But Kagan has made a remarkable debut, and, if she develops a positive vision in the years to come, she has the ability to make it resonate far beyond the courtroom. Jeffrey Rosen is the legal editor of The New Republic. This article originally ran in the August 18, 2011, issue of the magazine.